208 new immigrants from Ukraine celebrate first Hanukkah in Israel. A planeload of 208 new immigrants (olim) from Ukraine celebrated their first Hanukkah in Israel after landing in Tel Aviv on Tuesday, arriving on a charter flight arranged by the International Fellowship of Christians and Jews (IFCJ). The olim - the latest to come to Israel with IFCJ - arrived on the seventh day of Hanukkah and were provided with an Israeli breakfast, Hanukkah jelly doughnuts, and candy for the children in the group. They lit the Hanukkah candles on a menorah at the airport. Welcoming the group for this special holiday occasion was Israel’s Minister of Immigration and Absorption, Sofa Landver (Yisrael Beytenu). 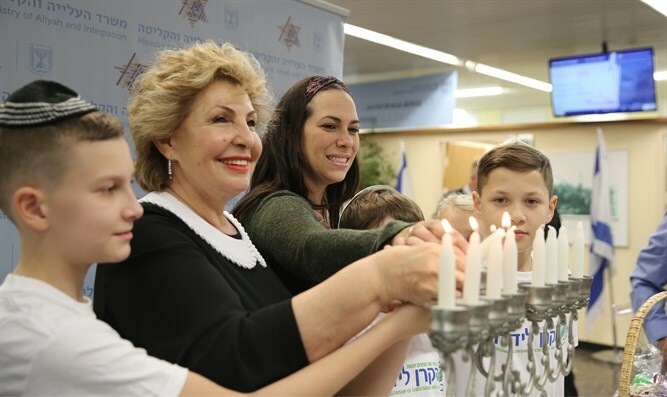 “It is so symbolic that you arrived in Israel at the height of the Festival of Lights – Hanukkah,” Landver said. “You are adding a lot of light to the State of Israel, and I hope that your first Hanukkah lights in Israel will light your way to building a new home” in the Jewish state. IFCJ representatives, including the Director-General of the organization’s Israel office, Jeff Kaye, and Global Executive Vice President, Yael Eckstein, also welcomed the olim. Among the olim were members of the Zhelezniakov family, spanning three generations. “We were always connected to Judaism, but we did not want to leave our senior positions and start our life all over again in Israel. 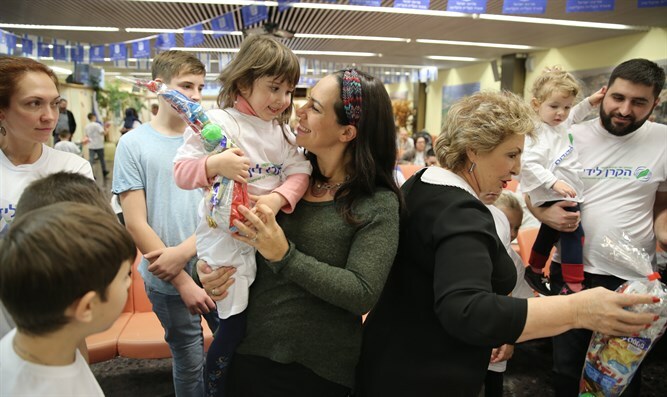 Now that we have reached retirement age, we decided that it was time to make aliyah, and our children and our grandchildren decided to join us,” said Anna Zhelezniakov. After their arrival the olim headed to their new homes across Israel, including in Arad, Acre, Eilat, Netanya, and Nahariya. Each oleh family will receive nearly $4,300 from the Israel Ministry of Immigration and Absorption, while IFCJ will also give them $800 per adult and $400 per child upon arrival, in addition to providing assistance with schooling, housing, living essentials such as furniture, employment training, and more. According to the ministry, 27,856 olim have arrived in Israel this year, including 6,760 olim from Russia, 6,709 from Ukraine, 3,270 from France and 2,772 from the US. IFCJ, which has been playing an increasing role in supporting immigration to Israel, brought more than one third of the new immigrants from 26 countries (besides those originally from English speaking countries) where Jews are experiencing economic challenges, rising anti-Semitism or security threats. Since late 2014, IFCJ has brought nearly 12,000 new immigrants to Israel, including the latest arrivals today. Please see attached photos of the new immigrants from Ukraine celebrating Hanukkah at Ben-Gurion Airport in Tel Aviv today. All photo credits: Daniel Bar-On.